With no two pieces ever quite the same the skill behind leathercraft focuses on initial sourcing, expert assessment and careful placement of the various grades upon the furniture. Sit down with Johnny and Hildy Kovacs and it quickly becomes clear the non-negotiable approach the brother and sister duo take and why they love working with the hides. “It’s everything about it – the smell, texture the touch & look of good quality leather shows furniture off at its best,” says Hildy. There are considerable choices available. Cheaper “processed” stock simply does not feel like leather. Nor are the most expensive and luxurious leathers necessarily the most practical for furniture in high risk environments. 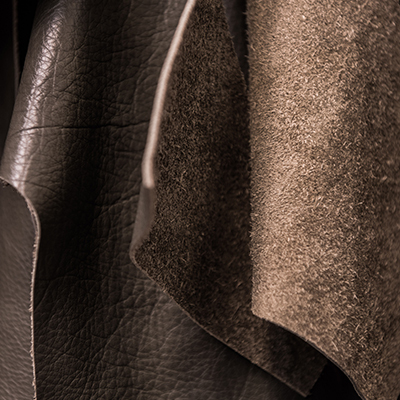 With semi-aniline leather there is a minimal amount of processing undertaken. A very light coating is added to ensure some protection from soiling while still feeling natural to touch. Placement is about making the most of the material’s different strengths. Each hide naturally has its durable thicker areas and other, more delicate places that can stretch further. Assessing each is a simple but exacting process. “There are different zones within each piece,” says Johnny. “Wear zones, visible zones, creases and hidden spots. Trying to get the right balance is not a science but an art. “It’s a jigsaw,” Hildy says. 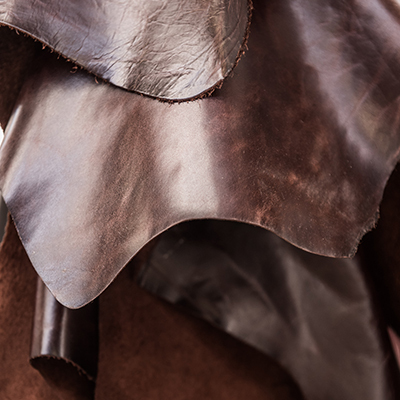 “You’ll never get a beautiful final picture without every piece in its place – and matching the others.” For her, the true nature of leather is something that continues to reward for decades after purchase.